I stopped by Dr Hannas office last Thur. to see if someone would look at my eye. i had gotten up with what I thought was a busted blood vessel. I wanted to make sure that was what it was, but knew without an appt., that I probably wouldn’t be seen. The young lady at the front desk worked me in and I was able to see Dr Hanna. Awesome group!! I’ve been going to Dr. Hanna for almost ten years, and I can’t be happier. Scheduling is a breeze and all of the staff is so nice. Finding frames within your budget is easy and the people who help you fit them know just what you need. They always explain my insurance benefits too! Definitely recommending them to all of my co-workers. I have been a patient of Dr. Hanna for many years. He is by far the most caring doctor a patient could have. You feel “cared for” the minute you walk into his office…that’s because his staff is professional, friendly and ready to prepare you for your appointment with Dr. Hanna. I really appreciate Dr. Hanna spending as much time as necessary to make sure I understand “why and what” he is recommending for my eye care! Thanks Dr. Hanna! I’ve been to a couple different eye care providers–a private practice ophthalmologist and the box-stores optometrists. I’ve never been so pleased as with my experiences at Dr. Hanna’s and have made his office my provider from now on. Everyone is friendly, service is prompt, my benefits and costs were explained clearly and I have confidence in the care I received. I chose this provider based on a recommendation and would like to now recommend to others. This is a great choice for your family’s eye care. Excellent, friendly, great atmosphere, and the doctor loves kids. Dr. Hanna gave my daughter a free pair of expensive sunglasses after the first eye exam she ever received. Dr. Hanna was great! Very informational! Also he answered every question we had. Our visit was not long at all! Good service! Made me very happy. Satisfied all of my needs and took a very good care of me. I would refer other people to this doctor! I called and got a same day appointment for a contact lens exam. The office staff was very friendly. Did not have to wait long to be taken back and didn’t wait long at all to see Dr. Hanna. Very impressed with Dr. Hanna’s professionalism and kindness. He performed a thorough eye exam and adjusted my prescription. I ordered new glasses and prescription sunglasses and am extremely impressed with them! I was helped by the staff pick the perfect frames for me! Will return and recommend to others! Everyone is always so nice, Dr. Hanna is the greatest and is very good at his job. Have been and will continue to come here for years. 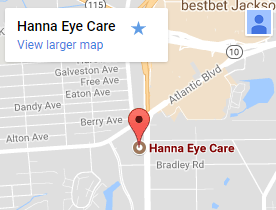 My eye care has been provided by Dr. Hanna for approximately 10 years. He is, by far, the best Optometrist I have ever known. Though I now live 75 miles away, I will continue to drive the distance to be treated by a man who I consider to be the best in his field. I highly recommend him for anyone needing anything from minor to major eye care.